Mr Whippy Soft Ice Cream specialises in providing the very best service for our corporate customers. We can assist with promotional campaigns and brand awareness to make your corporate event a big success. If you are a business or employer then why not treat your staff to an ice cream? Boost their work morale and productivity or just treat them ‘cos they deserve it! 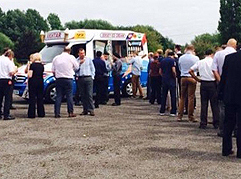 Mr Whippy Soft Ice Cream can provide one of our ice cream vans to visit your office, factory or premises, and your staff members can come along and get an ice cream on you. We can provide you with a choice of our 99 flake ice creams, or a variety of different ice creams from our menu. This special service is provided to you on a fixed fee basis depending upon the number of Ice Creams ordered. Read our Event Hire page.